Depending on how you're going to use AppStudio for ArcGIS, you may need to consider one or more licenses. In some cases, the licenses are free but still require you to acknowledge the use of different components. Included with every ArcGIS named user account at no additional fee. Allows you to build public-facing mapping apps with the predefined application templates from the AppStudio website. Create your own apps using your developer skills. Distribute apps within the enterprise. The ArcGIS Online help describes more about managing licenses. 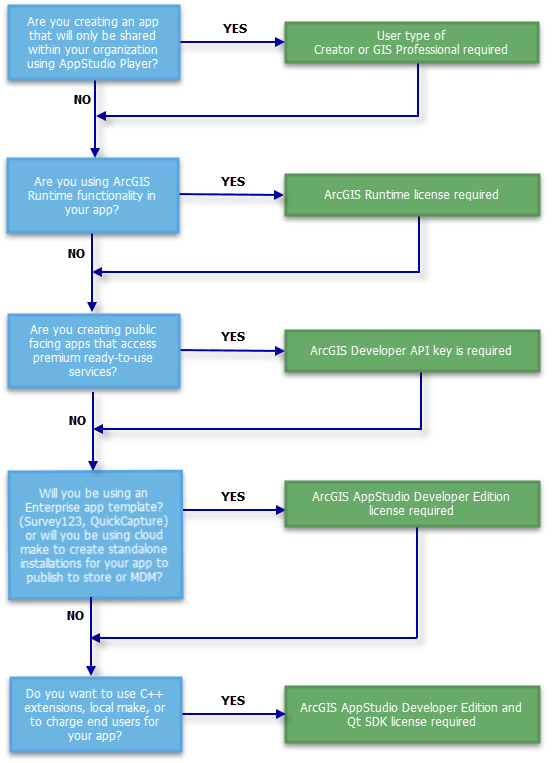 Ready to buy AppStudio for ArcGIS Standard? If you're in the United States, call 1-800-447-9778 or request pricing. If you're outside the United States, contact your local Esri office. For information on assigning an AppStudio for ArcGIS Standard license, see License AppStudio Standard. The app includes a License key (available for free with an ArcGIS for Developers account). Sign in to the app with an ArcGIS Online or ArcGIS Enterprise named user account. The app includes an ArcGIS Runtime Basic deployment license (available for purchase). Sign in to the app with a Level 2 ArcGIS Online or ArcGIS Enterprise named user account. ArcGIS Runtime Standard and Advanced licensing can be authorized using a deployment license (available for purchase). For more information, see License your app. The Qt Company has granted Esri the authority to embed the free version of Qt Creator in AppStudio. Although the free version is embedded, it's not subject to the LGPL that Qt Creator is usually licensed under, due to the license rights that Esri negotiated with The Qt Company. For users who want to create fee-bearing apps, The Qt Company requires that the Qt SDK be purchased. This requirement is not a function of LGPL terms, but rather a requirement of The Qt Company. The Qt SDK caters to users with different development and deployment needs, offering both open source and enterprise licenses. If you build a C++ extension and include it in your app. Requirements to use the Qt Quick Compiler (for security reasons). Requirements to use enterprise components. If you're going to create a fee-bearing app. If you need to use local Make. For additional details, go to http://www.qt.io/download/.